There are few activities that tend to strike fear into the heart of a technical arts director quite like recruiting for the tech team. Large-scale productions for Christmas & Easter? No sweat. Running ProPresenter and TD'ing the weekend ('cause my volunteer didn't show up)? I can do that. Programming moving lights on the fly? In our sleep. But coming up with ways to bring new people into the technical fold? Don't I have a root canal scheduled? Everyone wants to know how to recruit volunteers. Every interviewer asks it. And practically every TAD asks it once they actually get there. The plain and simple fact is that it's hard. It's hard to recruit volunteers for the church, period. People are way too busy, and we no longer live in a culture that values volunteerism. For the most part, people in this country are consumers. When they get to church, they want to consume, not serve. Recruiting for the tech team is doubly hard because there are so few people who would be good at it. Take a church of 1,000 people. There are easily several hundred who have the right temperament and gifting to work with children. But tech? Easily fewer than 100 (probably 50-60). And chances are 10-20 are already serving. So your pool is smaller to begin with. Couple that with the litany of excuses for not serving--no time, not skilled enough, can't handle commitment, and (my personal favorite) "don't feel led"--and you have a recipe for a challenge. I write all this not to discourage anyone, but to remind us that if we're struggling with recruiting, we're not alone. Just about every church I talk to has (or has had) a tough time finding volunteers. It's not your fault! It's just how it is. With that in mind, let's talk about some options. I've found one of the best resources for new tech team members is my current tech team. Since we all tend to gravitate toward people like us, it makes sense that techies hang with other techies. So ask them! Once or twice a year I ask my tech team who they know that could do their job. Sometimes the results surprise me. When I was looking for a church for my family (before I worked at one), I would check out the website in general and the tech/worship section in particular. Why? Because I wanted to know if there was a place for me to serve. Upper Room has a dedicated Technical Arts page on our site, complete with a volunteer application (a pdf that is sent to me when they finish it). I've picked up several volunteers that way. Jared Wells of Westside Family Church in Kansas City has done something that's been on my to do list for a while. They produced a video highlighting people on the tech team and why they serve. Selling the vision and making it look like a whole lot of fun is far more effective than begging for volunteers or shutting off the tech during a service to illustrate the need. People like to be needed. When you meet someone who fits the profile of someone you'd want on your team, ask them. Sometimes they say yes. Beckie Campbell of First Church of God Church in Vero Beach, Fl suggested lowering the time commitment that people serve. Rather burning people out and asking them to serve 2, 3, or 4 weekends a month, at First Church, people only serve once a month. That keeps volunteers fresh and also gives them plenty of time to attend church with their families. We've tried to follow that model at Upper Room as well, at least with tech. 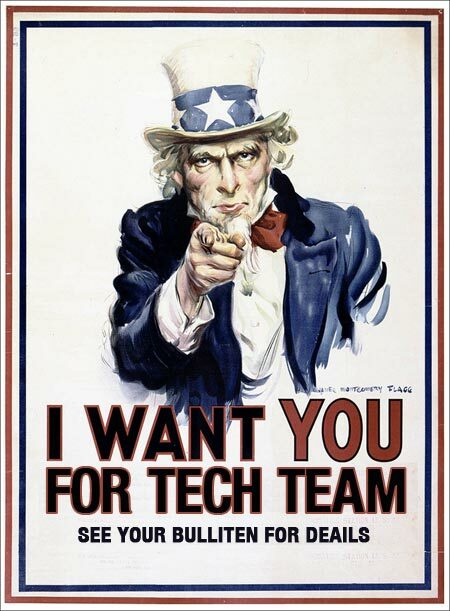 Interestingly, I'm running about 90-95% full on my tech teams, whereas our support teams run 3 weeks on , 3 weeks off and we are always looking for more people. So perhaps there's something to that. Ultimately, it comes down to getting to know people, and finding out what they're good at. That takes time, and it takes a commitment to being relationally connected. This is probably one of the hardest things for a tech person to do, because by nature, we tend to be on the weak side, relationally. But if we can find ways to get to know people, we will find people for our teams. This is by far, not the last word on this subject. If you have a method that's worked for you, please share it with the rest of us in the comments. I think we all have things we can learn from each other, and this is a great place to start.